Check us out on facebook or send us an email to learn more! Welcome to Show Me Mini Aussies! Our goal is to raise a quality Miniature Australian Shepherd you can fall head over heels in love with. We're a farming family of 5 located in west-central Missouri. We run a cow/calf operation and a livestock marketing barn as well. Our pups are raised here on the farm, well-socialized and exposed to many types of livestock. Aussies have been a staple on our farm for many years. We have some who work and some who just play and we love them all the same. Miniature Australian Shepherds are the perfect compromise between toy and standards because they're small enough to still lay on your lap and large enough to work. We strive to raise pups who have great conformation, temperament and intelligence. 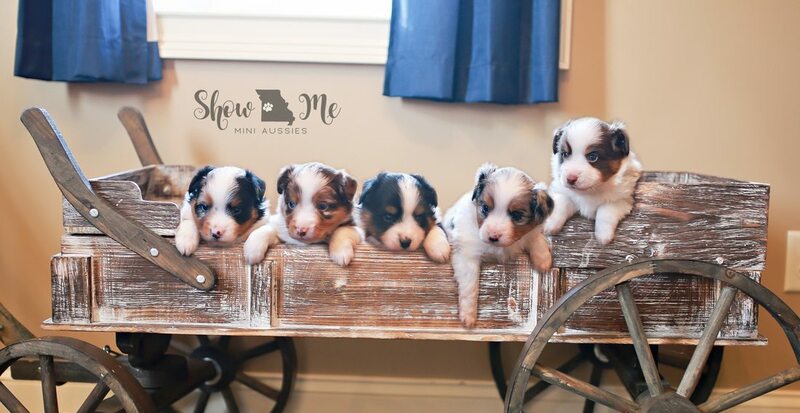 Miniature Australian Shepherds are perfect for farm living but can also be well-suited for town life when given adequate physical and mental exercise. All of our dams and sires have full genetic panel testing through Paw Print Genetics to ensure healthy puppies! Please look around the website and give us a call, text or email if you have any questions!